From the 7-Eleven Big Gulpers... DJ Eleven @ Whisky Bar on June 23. 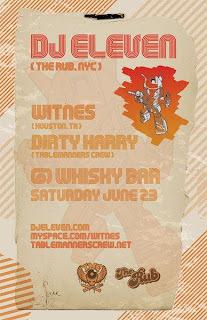 And from H-town, Witnes and from the ATX, Dirty Harry from the Tablemanners. DJ Eleven began his career in Oakland, CA as a founder of Local 1200, a crew that includes the most sought-after club DJs in the Bay Area. Working and living in New York City for 6 years, Eleven uses his large, diverse music collection and extensive experience to keep crowds moving in the hottest nightspots on both coasts. This DJ’s greatest strength is his uncanny ability to get any crowd out of their seats and keep them dancing all night long. His wide musical range allows him to spin sets including Hip-Hop/ contemporary R&B, Breaks and Rare Grooves, Disco/Funk/Soul, Reggae, and ‘80’s, with the skill that brings party people back for more.